Stump removal & grinding is the process of removing the stump that is left after a tree has been cut down. A heavy-duty professional stump grinder is used to axe out the tree stumps. We can also remove the stumps by hand depending on the accessibility to the site. Jungle Bros Treescapes offers specialised stump removal services using state-of-the-art machinery. Call us today for a quick quote and we’ll get that stump removed in no time! Are You Wondering why you should spend your hard-earned dollars on professional stump removal? Read on. Stumps are not exactly visually appealing for your garden. They create a visual disturbance in your otherwise perfectly manicured lawn. Old stumps occupy space in the garden which could otherwise be used for putting up play equipment for the kids or that water feature you’ve always wanted. If you have small kids running around the garden, old tree stumps can be very dangerous and cause injury. Untreated stumps in the backyard have the potential of re-growing into multiple smaller trees around the stump base. Hence, it is recommended to have the stumps removed along with the trees. Stumps that are left uncured can also become a breeding ground for termites, insects, pests and ants. This increases the possibility of these eerie creatures entering your home. At Jungle Bros, safety is of utmost importance to us. Our team of expert arborists is trained in the latest stump grinding techniques. Our stump grinders and hand grinders are periodically tested on safety parameters and are continually upgraded to match the industry standards of safety and quality. We don’t just grind the stumps and leave your garden a messy place! We ensure we back fill the holes with soil after the stump has been grinded to ensure your lawn returns to a levelled surface. Our stump grinding services are environmentally sustainable as we don’t use chemicals in the grinding process. 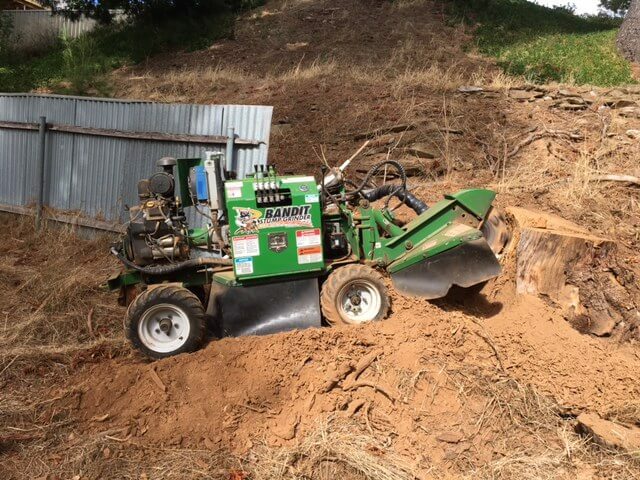 Please call us to arrange a free stump grinding and mulching quote in Adelaide and then let us do all the hard work for you!